A bank robber attempts to free his brother from prison. Good Time was not an ideal film to watch early in the morning. It required a generous amount of strong tea accompanied by a large Danish pasty in order to maintain sufficient mental equilibrium throughout its relentless pacing and pulsating techno-synth soundtrack. I’d had neither. My mental equilibrium was about to be shot to hell. Despite these personal deficiencies, I soldiered on through the assault on the nerves that was Good Time, the Safdie brothers directed odyssey of crime, chaos and tough luck. The film aims to make you feel on edge and jittery, and it succeeds at both. Good Time starts with what would prove to be its preference for grainy, full-screen close-ups - the film is pretty much ‘in your face’ from the off. Nik Nikas, (played by Ben Safdie himself), is in an outpatient facility for his learning disability; brother Constantine ‘Connie’ Nikas, (Robert Pattinson), feels responsible for caring for him, and doesn’t take kindly to his disadvantaged kin being lumped in with what he sees as mental cases. Connie is a tough guy and small-time criminal and he has a plan to get them out of the gutter and onto a farm where they can have their freedom. They are both living with their aged grandmother, a Greek immigrant, who, in the twilight of her life, has had just about enough of their bad behaviour. Slow brother Nik gets caught by the cops and ends up in jail. Being totally out of his depth, he irritates his fellow inmates into violence. The inevitability of his impending harm creates a feeling of queasy anticipation. Connie visits a bail bondsman only to find he needs another $10,000 to get Nik out. There follows a crude attempt to con his flaky girlfriend Corey (disturbingly twitchy, as only Jennifer Jason Leigh can be) out of the money. She’s reliably gullible but also unreliably, a total neurotic mess. The money never materialises. Brother Nik meanwhile, has been beaten up and has landed in hospital under police guard. Without enough money to pay the bond, Connie has to try an unlikely break-out. Of course, the plan misfires, resulting in the appearance of Ray (Buddy Duress), a doltish young punk who has connections among drug dealers. The film is about losers and the fear of losing out. Connie is clever - he can think on his feet. He tricks the cop guarding his brother, inveigles his way into someone else’s house, hastily seduces a willing 16-year-old (Taliah Webster) so he can use her grandmother’s car, and spontaneously hoodwinks the police, who try to pick him up at an amusement park. But it’s all done out of desperation, as each of his schemes leads to another debacle - a catalogue of bad luck and bad choices. We might laugh bitterly as each of Connie’s attempts to fix the situation only serve to make it worse. The haphazard chaos of Connie’s ‘night from hell,’ as he gets caught up in increasing amounts of nefarious activities, proves to be painful, but diverting. 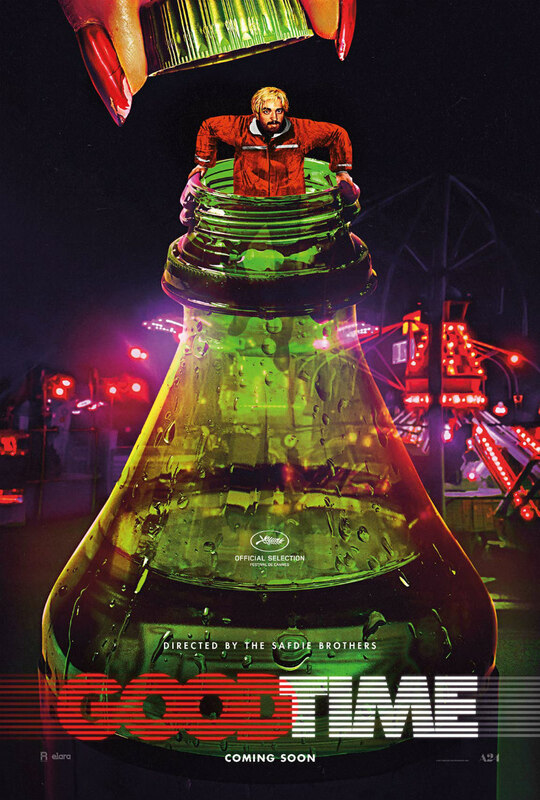 The frenetically tumultuous structure of Good Time is a more realistic portrayal of the nature of criminal behaviour, as is the representation of criminal adventurers living hand to mouth and being parasitically reliant on the safety net provided by their older, law-abiding relatives. 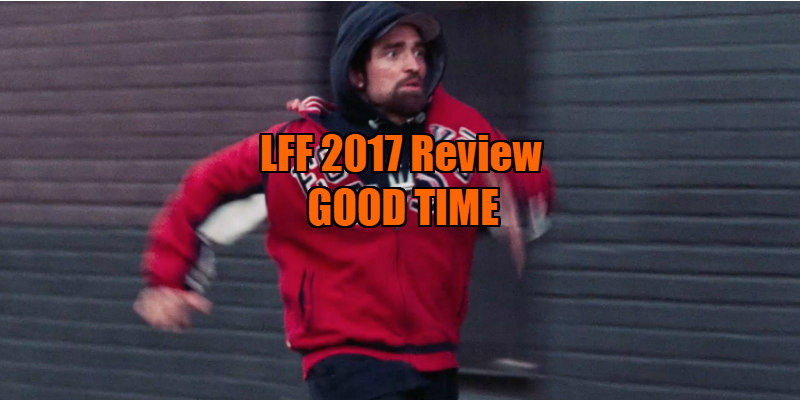 Good Time is low budget, gritty realism, dealing with unpleasant people in sordid situations. It also happens to be a totally uncompromising vision, sparking with mad, vibrant energy and individuality. What holds Good Time together is Pattinson’s strong, charismatic performance - conveying anxious energy and desperation through those bloodshot eyes - red-rimmed with lack of sleep, and consistently calculating schemes and making bad decisions. He somehow allows us to understand Connie without asking us to like him. With Twilight now in his rear-view mirror, Good Time establishes Pattinson as one of the most talented actors of his generation. Brothers Josh and Benny Safdie came out of Boston University a decade ago and were praised at Cannes for their first feature, The Pleasure of Being Robbed (2008). In Good Time they continue to develop their style, with claustrophobic close-ups and a migraine-inducing soundtrack. You may love this film or you may hate it, but you must acknowledge that it’s a rare cinematic occurrence to experience a movie which grabs you so relentlessly and refuses to let go. Good Time takes you into a dark alleyway, and then proceeds to slap the hell out of you. Good Time is in UK/ROI cinemas and streaming exclusively on Curzon Home Cinema November 17th.